In order to achieve the objectives of SOLAR-JET the work is organised in 4 technical work packages. An additional work package is dedicated to the management of the project (WP5) and the dissemination as well as exploitation of the results is organised in WP6. Assessment of the technological potential of solar kerosene. 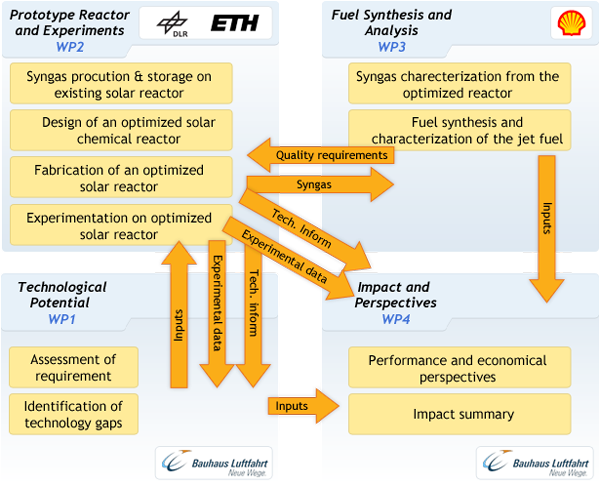 Comprehensive solar chemical reactor modeling that couples heat and mass transfer to the chemical reactions for the optimization of the reactor geometry and estimation of the scale-up potential. Optimized solar chemical reactor design for syngas production. Testing in a solar simulator facility with a light source similar to the solar spectrum that affords experimentation under precisely-controlled, reproducible conditions. Identification of further technology requirements and an initial assessment of the economic potential.